The best BIG systems for making your own STEAM DISTILLED essential oils! A note for those interested in Terpines: Terpines are a class of chemicals that appear in virtually all essential oils, from lavender to rosemary to Tea-tree oil and virtually all plants that contain essential oils. Please note that all of our steam distillers will extract with extremely high efficiency all of the terpenes from your plant material, no matter what the plant may be, ready for market with no further processing. Terpines extracted with our steam distillers have won best-of-show awards for the best of the best multiple times in French lavender festivals as well as many other plant festivals around the world. Once the terpines are removed, some of the remainder of specific plants magic, i.e. resins and heavy oils, need to be extracted by other means, as steam distillation just wont do it. But at this point the terpines are safely removed and can be married back to the remaining extracts later on. any other terpine extraction method does not come close to the speed, efficiency and quality of what our steam distillers will do!! In addition to our standard 10 gallon/33 liter sized still, we are now offering 15 and 20 gallon sizes in both gas and electric! All three stills (10-15-20) have been redesigned to incorporate many new features that make them even easier to use! For all three sizes we now lock the covers on with 6 quick-clips instead of the old metal band-ring, which makes it super easy to close and open the still quickly without tools, and also acts as a built in safety overpressure mechanism. For the electric stills we are now mounting the receiver directly on the side of the still rather than separately on a lab-stand. This gives you added security that the glassware is securely and safely mounted and also takes up less floor space. 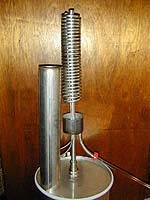 Float valve and small glass crossover tube are now standard equipment on all electric stills. 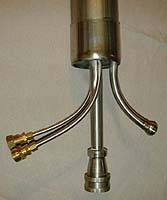 For gas stills, float valves are $150 additional, and stainless steel crossover tubes are standard. Now back to our regular page--- The following descriptions are for our old 33L still. Mostly everything here still applies to our new models, but the improvements mentioned above aren't yet mentioned below. We'll be updating the entire webpage to reflect the changes very soon! 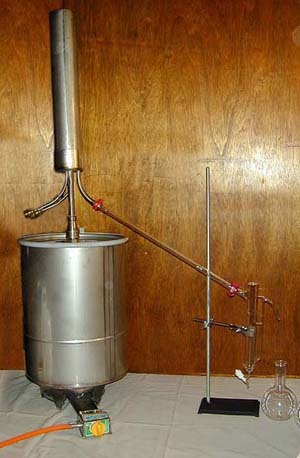 to be the perfect steam distillation system for medium sized needs. Many departures have been made from "standard" steam distiller designs which results in highly improved performance and maintainability. Maintaining the entire biocontainer at exactly boiling temperature (100c) during production is very important for obtaining maximum quality and quantity of both essential oil and hydrosol. For big systems this usually isn't practical. Big remote steam-fed bio-chambers are usually just sitting out in open air, which by definition allows their walls to be cooled by that air, so some water condensation on the inside of those walls is always going to occur. Any water that ends up in the biocontainer robs you of potential hydrosol, and also renders any biomaterial it comes in contact with undistillable, and the biomass touching the chamber walls may not get properly distilled at all. It's a difficult problem... insulating the biocontainer is an answer, but costly and physically cumbersome. Also, in large steam-fed distillers that use separate steam generators, there a continual dance of controlling pressure and temperature of the steam going into the biochamber- tricky to get right. We've come up with a deceptively clever way around all of this...to keep the biocontainer dry and insulated and not have to hassle with steam pressure or temperature, we simply put the entire biocontainer inside of the boiling chamber!! Quite different than simply chucking the biomass into the same vessel as the boiling water, we build an entirely separate housing inside of the boiling chamber, and then put the biomass in that "inner" housing. It makes sense... this way the entire biocontainer is surrounded inside and out by 100 degree steam- Thus the entire system works at exactly 100 degrees c, and the biocontainer stays dry because it cannot condense any water on it's walls. What this means is that you'll get the maximum amount of hydrosol possible during a run, because steam that would have condensed in other systems will now be made into hydrosol ! Your plant material will never overheat or get wet, and above all, your distilled oils and hydrosols will be of the highest quality possible, period. Gone is the need for temperature or pressure gauges, because our "open-to-atmosphere" design means that steam pressure can never build up in the system, making it much safer to operate and insuring that the distillation process will take place at exactly 100 degrees C (at sea level) and not a degree higher! 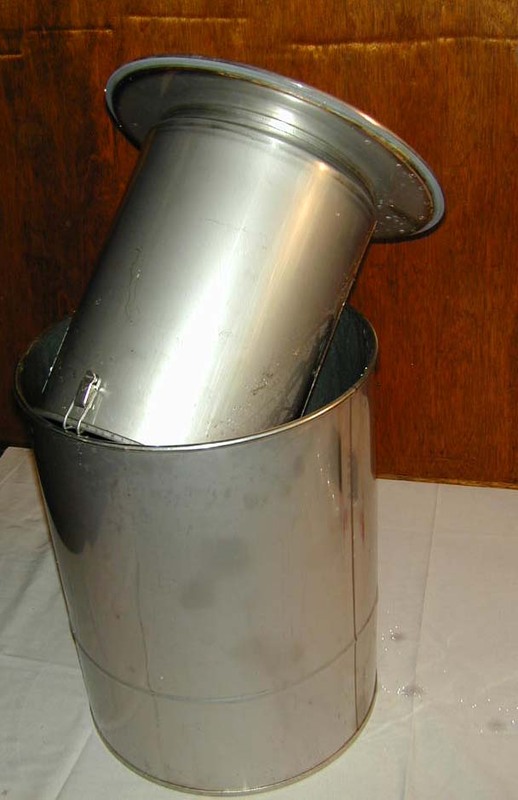 Totally simple to load and unload... you remove the quick-disconnect condenser, pop the top of the boiler, lift out the biocan, turn it upside down and unclip it's perforated lid, and load or dump your biomass!! There is enough room between the bottom of the biocan and the boilers' bottom to hold about four gallons of water. Two gallons is more than plenty to do most distillation runs. We've found that with most plants after about 4-6 liters of hydrosol have been produced, the distillation process is done. Note: If you need to distill for longer periods of time, we can provide an optional float valve inside the boiling chamber that will keep the boiling water level constant for as long as you care to distill. EOSS33's simple condenser design is also a departure from the usual large still condenser. Steam and oil vapors run up thru the center tube and exit inside at the top of the condensing chamber. 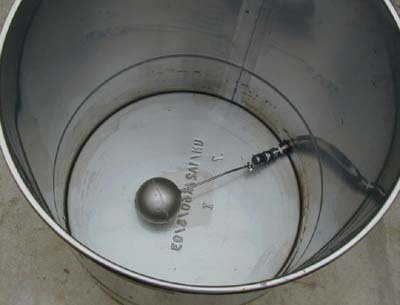 From there the vapors are forced downward where they encounter the cold cooling coils, causing them to condense and drip down to the bottom exit pipe. (2) The surface area of a tube is much greater on the outside than the inside. By running the water inside the coiled tube and the steam on the outside of it, the maximum cold surface area possible is avaliable to the steam. This plus the fact that there is actually 20 feet + of tubing coiled up results in an incredibly efficient condenser that is physically much smaller than any comparitive setups. (4) Our compact vertical condenser design and quick disconnects make our distiller take up less floor space and keeps the system compact. simple, and easy to assemble and disassemble. During normal operation, oil blobs flow into the receiver and collect on the surface of the water in the receiver. 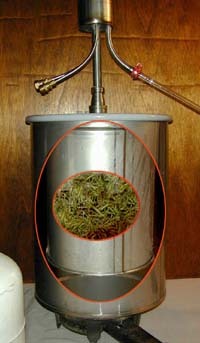 As the distillation progresses, the oil layer grows downward. When it's time to tap some oil off, you turn the valve which closes the hydrosol drain, thus forcing the water level inside the receiver higher. This results in the oil spilling out the upper drain port, down into the valve, and out the spout. Otherwise the receiver is basically the same as our smaller ones... the oil and hydrosol are automatically separated; oil collects inside the receiver and floats on top of the water, and hydrosol continuously drains out of the side port. Units with the electrically powered option may be used indoors with good ventilation, and do not need to be run on fireproof floors because they don't get as hot on the bottom as do the gas fired versions. instead of the glass version….this is for gas fired stills only. From burner turn-on, It takes about 2 hours to produce 4-6 liters of hydrosol and whatever oil is contained in the plant. This uses, not surprisingly, about 4-6 liters of boiling water. We always load the can with 3 gallons just to be on the safe side. The BBQ propane tank will go at least 5-6 distillations before needing to be refilled. CONDENSER WATER REQUIREMENTS: The condenser uses tap water for cooling, at a rate of approximately 1.5-2 gallons per minute. 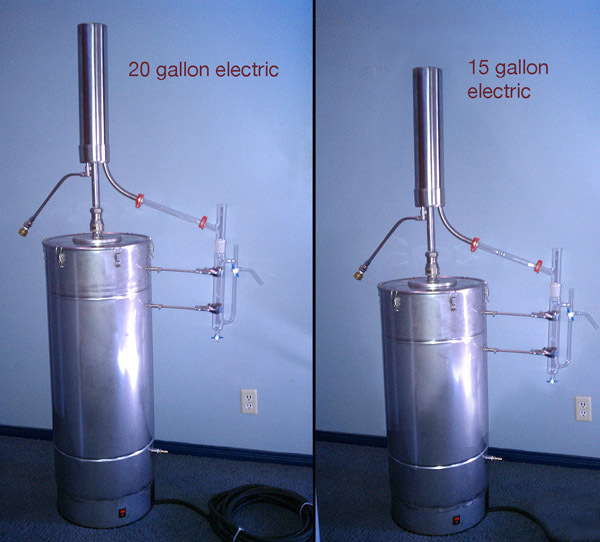 We make this industrial sized 100 gallon distiller basically the same as what's described above. may be required to keep the material from clumping into a non-distillable mess. Please scroll to bottom of this page for more info!